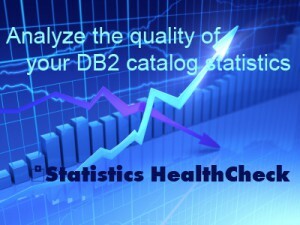 Statistics HealthCheck for Db2 z/OS freeware automatically checks and corrects catalog statistics and improves SQL Performance. Statistics HealthCheck (SHC) analyzes a Db2 subsystem and tells you exactly what is “wrong” with your statistics, thereby enabling you to proactively correct any problems that might negatively affect your performance in terms of access paths. Using a violation system, SHC precisely pinpoints which objects could benefit from a RUNSTATS utility or those that otherwise require statistics housekeeping. The foundation of the extensive rule system used by SHC is based on IBM’s own recommendations for maintaining good statistics. Statistics HealthCheck is particularly useful as a prerequisite for a Db2 version migration. Use SHC to assure the basics of a successful Db2 9 -> 10 or 11 migration with optimal Catalog Statistics. An additional Add On can be purchased to generate the required RUNSTATS, with exactly the right options to fix inconsistent statistics of the object discovered also the corrective DELETEs for the SYSCOLDIST and SYSKEYTGTDIST tables (and the xxxSTATS ones if partitioned).